Cheri Cherin at Ndjili, Kinshasa (Fotos by Prof. Armin Prinz, Austria). Joseph Kinkonda, called Cheri Cherin, was born on Febr. 16th, 1955 in Kinshasa (Democratic Republic Congo, formerly called Zaire). 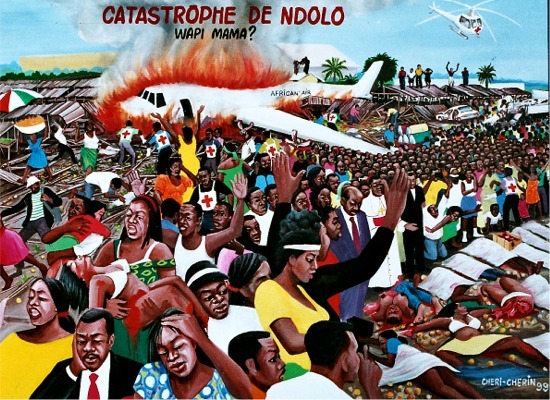 He studied 1977 at the Academie des Beaux Arts in Kinshasa under the Austrian ceramics-artist Peter Weihs. During this time he started to paint posters in his residential-quarter Ndjili. He created pictures on the walls of bars, barbershops and small boutiques. Besides he created impressive pictures of daily life and also paintings with very serious contents. Today he is one of the best known painters in Kinshasa and a teacher to many young talented artists. Exhibitions: 1978 Art Partout, 4eme CIAF, Academie des Beaux Arts, Kinshasa; 1999 Centre Culturel Gembloux and Center for African Art, New York. 2001 Bruxelles, Kinshasa and Museum für Völkerkunde Wien. 2002 Galerie Marc Dengis, Bruxelles; 2003 "KIN MOTO NA BRUXELLES", Hotel de Ville de Bruxelles. 2004 Fondation Prince Claus (Lattage), Galerie Art Korner (La Haye), Hollande; "Africa Screams - Das Böse in Kino, Kunst und Kult", Kunsthalle Wien, Österreich. 2005 "Regards sur les 15 ans de transition", Hotel Memling and Bibliotheque Wallonie-Bruxelles. 2006 Africa Remix - Contemporary Art of a Continent, Mori Art Museum, Tokyo; 7ème Biennale de l´Art Africain contemporain, Dakar; 2007 "Le Congo d'hier, d'aujourd'hui et de demain", Hotel Memling, Kinshasa; 2008 "De Stadsschilders van Kinshasa", Hofke van Chantraine, Belgium; 2010 "O Congo. 50 ans d'independance en 50 tableaux", De Warande, Turnhout, Belgium; "FUTUR CONGO", De Warande, Turnhout, Belgium; "Independance! ", Musee Royal de l'Afrique Centrale, Tervuren/Brussels, Belgium; "50 Jahre Unabhängigkeit des Kongo in Bildern", Castle of Puchenau, Linz, Austria; "Die Freiheit und der Kongo", Jägermayrhof, Linz, Austria. Studio address: Ludisi n.16, Q.7, C/Ndjili. The car representing the Republic of Congo is stuck; the president and the four vice-presidents can't do anything.The members of the political parties - symbolized by animals or beasts - run for food. Each time elections are held, the devil steals away the votes. 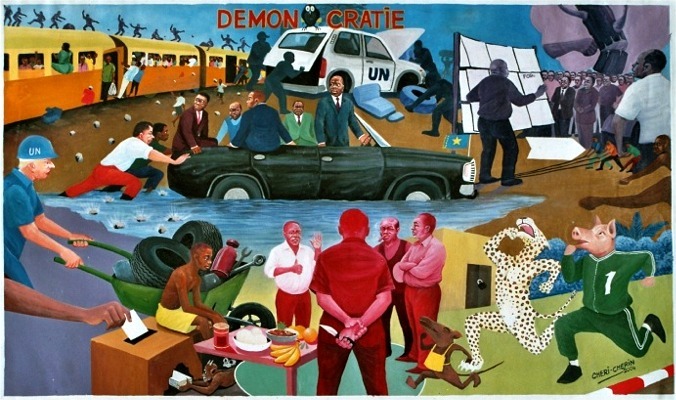 This painting was also published in ZAM - Zuidelijk Afrika Magazine 04/2006. It was used by "The Economist", London, in an article about the Congo in Facebook on Sept.26th, 2017. Cheri Cherin who, along with Cheri Samba, is one of the most popular contemporary artists in Congo, wants to analyse the mechanisms of a society in the progress of disintegration with appellative works and to occupy a moral counter-position at the same time:'We artists penetrate people's depths in order to depict their essential being'." Cheri-Cherin in front of his two paintings "Immigation Clandestine" (left) and "Course au Pouvoir" (right), both created in 2007. Two fotos by Prof. Armin Prinz, unit Ethnomedicine of the University Vienna, Austria. (Fotos mounted together by Werner Horvath). "Course au Pouvoir (Race to Power)". Oil on canvas 130 x 333,5 cm, 2007. "Immigration Clandestine (Illegal Immigration)". Oil on canvas, 140 x 355,5 cm, 2007. "WAPI MAMA" means: Where are you, mam? (Words of a child looking for its mother). 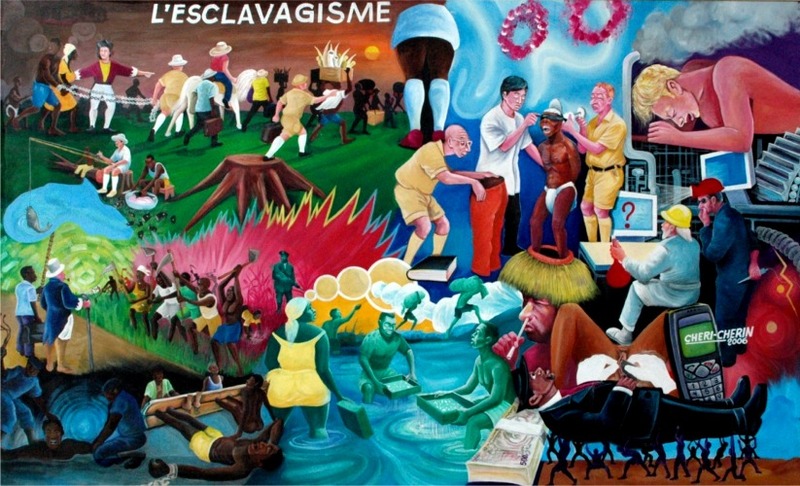 "L'Esclavagisme (Slavery)", oil on canvas, 152 x 250 cm, 2006. Fotos of the paintings "DEMON-CRATIE" and "L'Esclavagisme" are also in use for the Multimedia Guide of "TATE Modern" in London. Unlike a traditional audio tour, the Multimedia Guide allows information about artworks to be provided to visitors on a small handheld computer that can be carried around the gallery in the palm of one’s hand. As well as listening to audio commentary, visitors can see videos and still images on the screen that provide additional context for the art, and can explore details of the works on display by touching the screen. The guide is carefully constructed, with information provided in short segments, so that the viewer’s attention is consistently drawn back to the artwork on display. Tate has won a Bafta (British Association of Film and Television) award for its use of this new technology, and has received international acclaim for its work in this field. 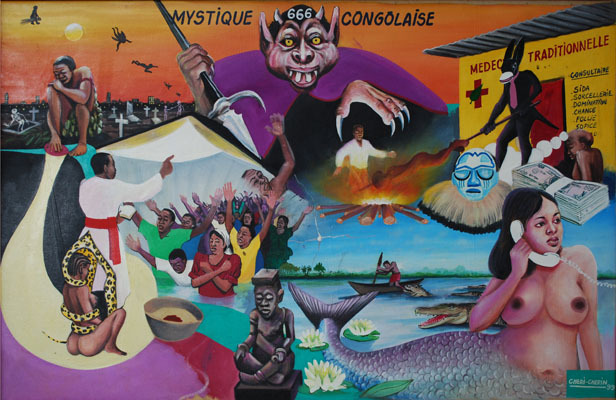 "Mystique Congolaise", oil on canvas, 62 x 96 cm, 1999. 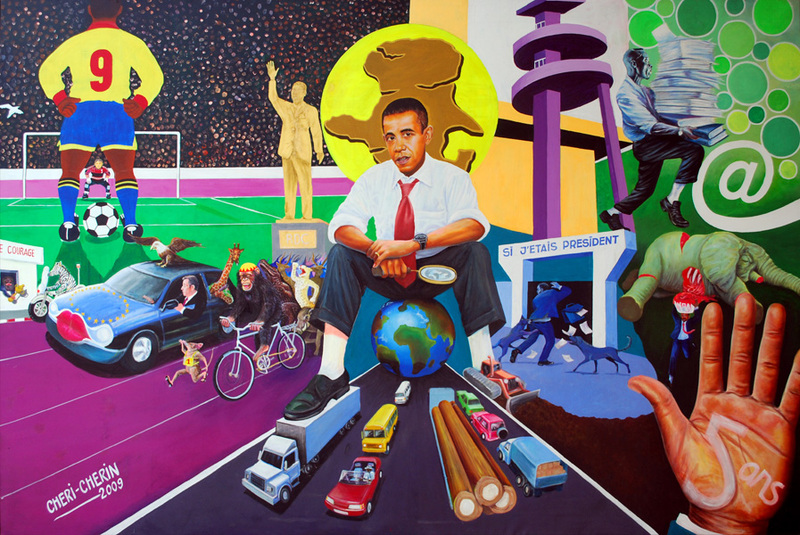 "Si j'etais president" (Barack Obama), acrylic on canvas, 200 x 300 cm, 2009. 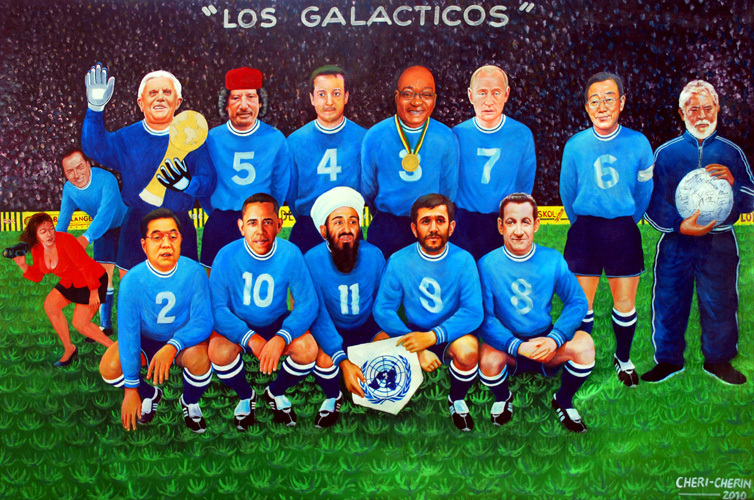 "Los Galacticos" (Global Players), acrylic on canvas, 144 x 220 cm, 2010. Barack Obama, Osama bin Laden, Mahmud Ahmadinjed, Nicolas Sarkozy, Muammar Qaddafi, Vadimir Putin, Silvio Berlusconi (after women) and finally Pope Benedict XVI as gaolie (and some others).